Creating or redesigning your website? You can do it! How do I attract more visitors to my site? What’s the best way to convert site visitors to customers? Will my site integrate with my current CRM? The thought of creating or redesigning your website can be overwhelming, but managing your brand presence in the fast-moving digital world is doable. The internet is full of lists and tricks to make your business website perform like a well-oiled machine. If you have the time, you can find pretty much anything you need to help turn your website into a lead generation and conversion tool. However, most of us need to spend our time doing what we do best… running our businesses. A website that is properly optimized and designed to capture and convert prospects will make your business money. 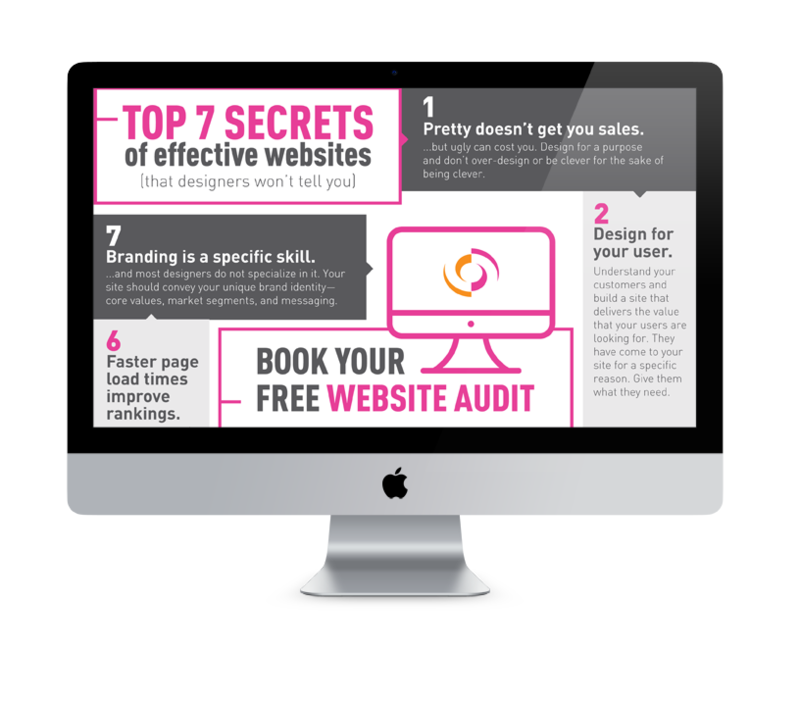 If your website is not making you money… or at least paying for itself… here are 7 of the top secrets we have used over the years that can help transform your site into a profitable business tool. It’s true. I can’t believe I am writing this! As a designer, this actually hurts my heart AND eyes. High converting sites don’t have to be pretty. In fact, some of the prettiest sites I’ve ever seen do not convert at all. So don’t get stuck on the aesthetics before your refine your conversion strategy and user experience. A beautifully designed digital brochure site can be outdated and ineffective in today’s market. The design must serve a purpose and help lead the visitor through the site to the desired outcome. Now that we’ve let the cat out of the design bag about pretty sites, let’s be very clear… an ugly site can cost you. Ugly sites are chopped up, over written, cluttered and confusing. Ugly sites can also feature outdated site styles, and/or unprofessional use of colors, fonts, and effects. Simple and effective strategies interlaced with beautiful design is the win-win! You know your customers better than anyone else. Your site should reflect that. Design a site that delivers the value your customers are looking for. They have come to your site for a specific reason. Make it easy for them to find what they need. You don’t need to pull out the therapist couch, but digging into your customer behavior is key to increasing the effectiveness of your website. The best designs influence the actions and reactions of the user. Every color, shape, font, image, and visual element on the page will impact a response. Your clients don’t care how much you spend on your site. You can find web designers across a variety of price levels who create compelling sites that convert sales. It really depends on what you want to accomplish with your site. Do your research and have a plan in place so you can engage the best person for your site development. Your site should make you money, and any investment you make should return multiple times over. But remember you get what you pay for, and good services that achieve results may require more of an investment. GET YOUR 7 SECRETS CHEAT SHEET! 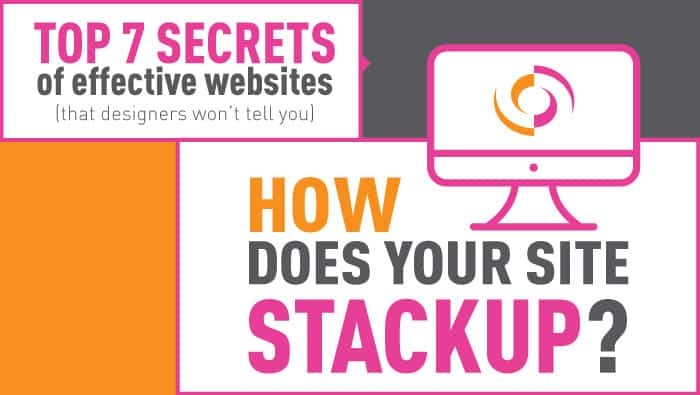 The top secrets that designers use to create effective websites. Believe it or not, the old saying “less is more” holds some truth. White space is a strong element of professional level design. It is more than simply offering a clean and sophisticated use of space. The spaces between visual cues can help guide your visitors through your site, leading them to the desired call to action, or highlighting an item of importance. When you strip away distractions, you can focus on what is important. This saves time and prevents site visitors from being distracted or losing interest. Used correctly, white space can be your friend. Time is money, and your visitors shouldn’t have to wait for your site to load. In general, the attention span of the average user is declining… especially with the increase of mobile users. You only have a few seconds to grab the attention of your site visitors, and if your load time is sluggish they will leave. Keeping all the content optimized allows design and function to work together to improve the user experience. Plus, Google likes it! …and most designers do not specialize in it. Your site should convey your unique brand identity— core values, market segments, and messaging. There are great designers and amazing developers, but it’s a rare thing to find a creative shop that specializes in branding. Your site is an extension of your brand and brand promise. Select a professional that understands the power of your brand and can help you maximize your brand potential. Who the… What the… How the?